If you or someone you know doesn't know how to ride a bicycle...we can help! If you can ride, but don't feel comfortable on roads, we can help with that too. 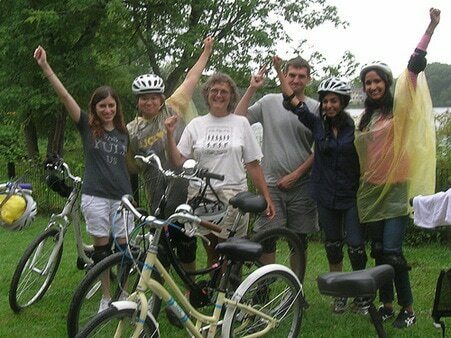 The Bicycle Riding School teaches people of all ages to ride bicycles, including adults who never learned as children. If you can already ride, we can help you understand how to ride more safely in traffic. You can get an idea of what it means to people from the letters and press coverage we've gotten. We organize group and individual lessons. All classes meet at 14 William Street, near Davis Square, in Somerville, Massachusetts, unless otherwise indicated. Over the winter, we teach any people who want to learn in the cold, though we don't have any group classes. There is a good possibility for spur-of-the-moment lessons on a warmer day. We are also open to traveling. If you live in a place that is warm during the winter, and want to learn to ride, let's talk about whether it might work out. 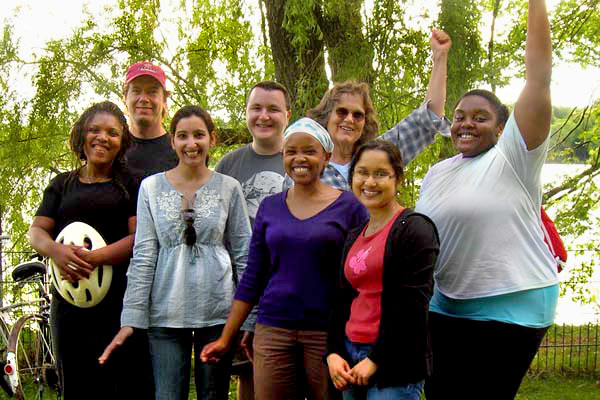 If you can find a few students, and someone can provide hospitality, it could make sense. Even more ideal would be also having someone who wanted to learn to teach riding, so we could spread the method and thereby spread the joy. We have lost our long-term teaching space and are working in various new places. The city is renting us space at the Brown School and a basketball court at Conway Park, for which we are grateful. Dr. Mouhab Rizkallah, the owner of The Braces Place, in Davis Sq, is also generously letting us use his parking lot when they are closed on the week-ends. Being able to use this lot has really helped us to survive in this period of transition. Thank you, Dr. Riz! The four teachers at the school are Susan McLucas, Pata Suyemoto, David Goehring and Jenny Norcott. Susan has been teaching riding since the mid-80's. Pata has taught with us since 2007 and teaches our road riding and long-distance riding lessons as well as beginners. David has taught since 2016 and teaches both beginners and road riders. Jenny has been teaching with us since early 2017. 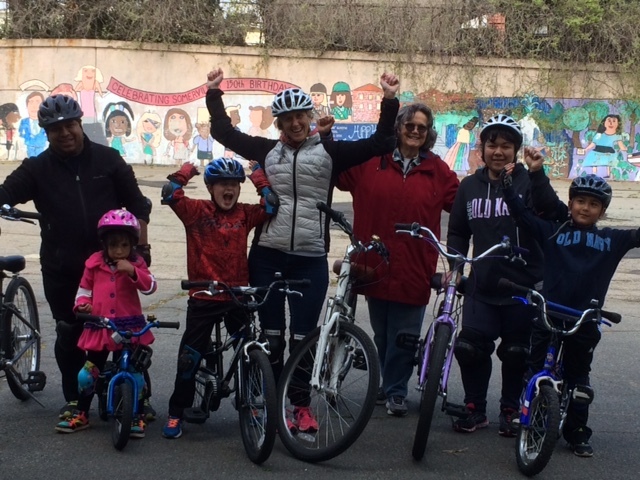 We teach beginners to ride and organize alumni rides for adult graduates, we teach people who can ride to be safe on the streets and we teach bike repair. 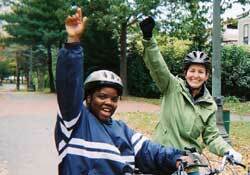 We occasionally share our experiences as teachers in the Bicycle Riding School Diary. Fill out this form to see about signing up. (617) 776-6524 or SusanBMcL@gmail.com . If you don't see a class with a schedule that suits you, let us know and we'll see what we can do. We find that often people may need more than 2 open space sessions before they are ready for the path - that is totally fine! In this case, we try to schedule them to drop into some additional lessons either with another class, a private lesson or an open space practice session with others, that we set up from time to time. Group lessons cost $40 each time, if you can afford that, with a sliding scale going down to $10 a lesson, if you're really struggling, financially. Groups of just 2 people are $50-$20 each. Individual daytime lessons cost $80, if you can afford that, down to $25 a lesson, if you need to pay less. Individual evening lessons are $80-$40. All lessons are an hour and a half, except graduation classes, which are about two and a half hours. Rides on the path for people who've graduated but want some more practice in a group. The rides will be around 5-8 miles, depending on how far people want to go. Minimum 3 people. $30-$15 per ride. Inter-generational classes are set when a family expresses an interest. Watch a documentary short film about Susan McLucas and the School. We will set up dates. Contact us if interested. 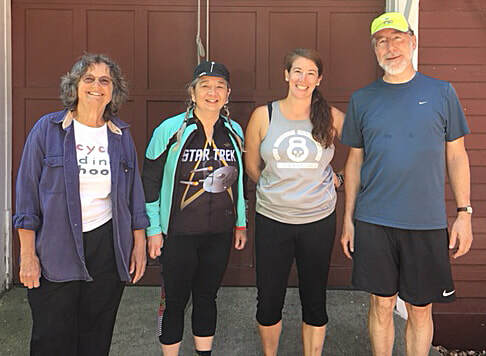 This four-session class is for people who know how to ride a bicycle on a bike path or trail, but who are not yet comfortable on city streets. The class will cover basic bike fit and safety, getting on and off your bike properly, using hand signals, how to use your gears effectively, where to be in the road as a cyclist, and negotiating various traffic patterns. The first class is off the bike. Private road riding lessons are also available on an ongoing basis. Look behind your shoulder, (especially your left shoulder to look behind you) and still go straight. Each class costs between $80 - $60 per session (depending on what you can afford). Further scholarship is available. Classes are limited to six students max. Individual Road Riding lessons are also available. contact Pata at (617) 549-3087 or kotoridesigns@gmail.com . We let our students decide whether they think it's too rainy, snowy or cold. Sometimes, if people are into it, we hold classes in the rain or snow, or when it's really cold. Just let us know if it's too rainy, snowy or cold for you. The school is located at 14 William St. in Somerville, MA, USA. It's the 4th left off College Ave. coming from Davis Sq. (or the 3rd right coming from Powderhouse Sq.). Come to the side door of the house, near the big red barn. What's a beginner's class like? Adult classes have up to 5 people in them, and consist of 4 classes. At the first class we choose bikes for people and walk or take the bikes in cars over to the place where we work, different places different times. We take the pedals off and people get their balance by rolling down the gentle hill. When they have their balance, usually some time during that first or second class, we put the pedals on and they learn to pedal. Everyone goes at their own pace. If people are really struggling, we offer the option of switching to private lessons. By the third class, we usually go to the bike path, Linear Park, which connects to the Minuteman Bike Path. Often some people come in, in between classes, to get ready for the bike path on the third class. The fourth class is graduation day. 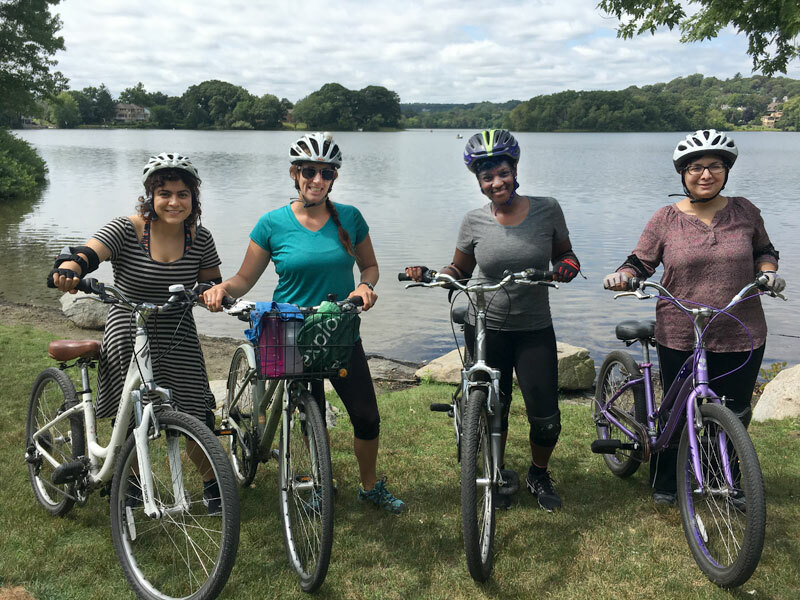 We go farther on the path, usually to Spy Pond but sometimes to Alewife, where we have a picnic and enjoy the fact that everyone learned to ride. Diplomas are given out and pictures are taken. The last class usually lasts about two and a half hours. Kids classes have up to 3 people in them and consist of 4 classes. Not everyone needs 4 classes and it is all right to tell the teacher and not come to all the classes, if your kid is good to go before the 4th class. Some kids need more than 4. For kids who are really struggling, we offer the option of switching to private lessons. If parents like the idea, they can help out by pushing their kid around, while the kid gets their balance and the teacher is pushing other kids around. If not, it works to roll down the hill and walk back up, though kids often find this more tedious than grown-ups do, so pushing works nicely. The teacher will supervise, to be sure the parent isn't pushing too fast or too slowly, or trying to hold the kid up. You will start out on a bicycle that might seem too small for you. You will be able to reach the ground flat-footed, while sitting on the seat. If you start to fall, you will simply put your foot down and catch yourself. We will start out really slow. If you're not going fast, any problem that comes up will be much more manageable. Susan McLucas is the teacher for the group classes for beginners. She and Pata Suyemoto both give individual lessons for beginners. If you have questions or to register for beginners' classes or lessons, contact Susan at (617) 776-6524 or SusanBMcL @ gmail.com. For people who already ride a bike, but are nervous riding on roads, we also teach negotiating traffic to individuals and small group classes. Pata Suyemoto does most of the street riding teaching. 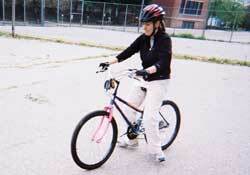 She is a League Cycling Instructor (LCI) with the League of American Bicyclists. Pata, is back from her cross-country trip. She rode 3,800 miles out to Washington. See her blog http://www.thepolkadotjournal.blogspot.com for a report on her last few months. She is now available to do road riding lessons and will happily help people get comfortable in traffic. To sign up for the Street Riding class, or with questions, contact Pata at kotoridesigns @ gmail.com or (617) 549-3087. If you're out of town and want to learn to ride, try our Teach Yourself/Other Teachers page first and see if anyone teaches beginners close to you or if you can figure it out from the instructions given. If not, come to Boston; we'll send you a list of places to stay. Lots of people have made the trip and they're always delighted. One guy came from Brazil to learn to ride! With a couple of lessons each day, in three or three days (4 max), you'll be up and riding. Alternatively, try to find some other people in your area that also want to learn to ride and see about bringing Susan or another of our teachers to your town. Contact Susan for more details, SusanBMcL @ gmail.com or (617) 776-6524. She'd love to travel to warm places during the winter and teach people to ride there. We can work out logistics like bikes and the place and she can bring the pads and helmets. In the last 30 years, we have taught about 4,000 people with only a handful people who weren't able to make it work. Virtually everyone who puts their mind to it, and gives it the time it needs, can learn to ride a bicycle. One of our students has only one leg and did very well. Our oldest students are in their 80's, our youngest was three. 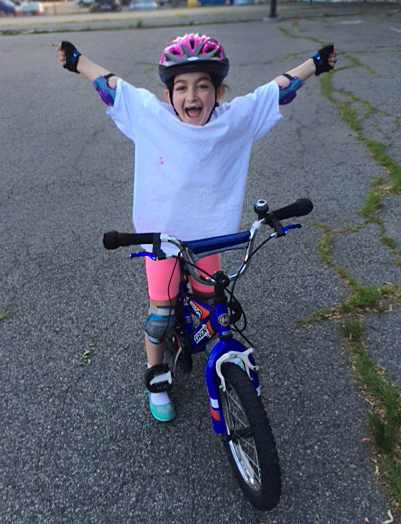 "It was so amazingly liberating to be biking along the path with the wind in my face. Now I know why so many people bike - because it's fun! Thank you so much for offering this class and for nurturing such a warm and encouraging atmosphere!" Everyone has their own reasons for not riding sooner in life (except our very young students), but everyone is glad to get past whatever it was that had been holding them back from riding. If you don't ride a bike, why wait? If a friend of yours doesn't ride, you can get them a gift certificate or just have them call us.